n order to make sense of France as a whole we have devoted a section to each of its major wine regions. 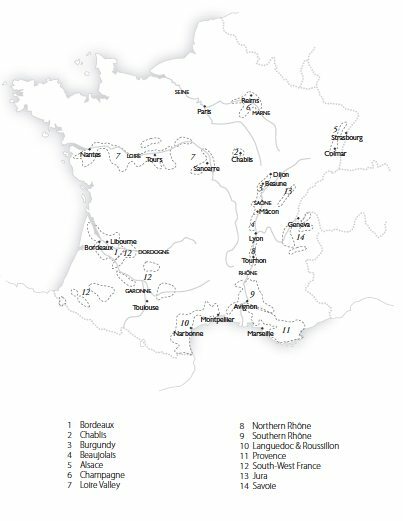 As an aid to orientation, the major appellations are listed under their respective regions. More detail of each, as well as on other exciting smaller appellations, can be found at the start of the individual chapters that follow this Overview. For both quality and quantity this is France’s most important wine region. Wines vary from simple everyday reds to some of the world’s most expensive classic crus. The Médoc provides all but one of the great Cabernet based Classed-Growths of the Right Bank, the best sites at Margaux, Saint-Julien, Pauillac and Saint-Estèphe are found on superbly drained gravel soils. Good wines can also be found in the Haut-Médoc, Listrac and Moulis ACs but the terroir is less propitious. Pessac-Léognan is a source of not only some great reds but whites which at their best rival the great wines of the Côte de Beaune. Graves to the south produces some good wines without the depth or class of Pessac-Léognan. Some of the worlds greatest botryitised sweet wines are produced at Sauternes and Barsac. Almost all the new wave of Bordeaux reds have emerged from the Right Bank. Many top Châteaux have been isolating special crus and bottling them separately and other small volume garage style wines have also emerged. Some are exceptional, some decidedly less so. This revolution has largely occurred in Saint-Émilion, rather than the much smaller Pomerol AC. Some of the best value has begun to emerge from the lesser and satellite appellations. The vast track of the Entre-Deux-Mers to the south of Saint-Émilion continues to offer good value whites. This most famous wine region makes some of the finest examples of both Chardonnay and Pinot Noir. Chardonnay can achieve success almost anywhere but the tricky Pinot Noir achieves rare greatness here. One of the wine world’s most famous names. Located halfway between Beaune and Paris, these are distinctly cool climate Chardonnays. The white ACs include Petit Chablis, Chablis, Chablis Premier Cru and Chablis Grand Cru. The best wines have both a piercing minerality as well as a complex citrus and leesy character. Occasional fine Sauvignon is made under the Saint-Bris AC. Some Pinot Noir based red is also made as Irancy or under several different Bourgogne suffixed names. The Côte d’Or is synonymous with Burgundy and includes all its great red wines. It is comprised of two parts. The more northerly Côte de Nuits (mostly red) includes the famous villages of Gevrey-Chambertin, Morey Saint-Denis and Vosne-Romanée. In its southern continuation, the Côte de Beaune, some of the world’s greatest dry whites are produced from Meursault, Chassagne-Montrachet and Puligny-Montrachet as well as some very fine reds, from the likes of Volnay and Pommard. The Côte Chalonnaise offers some wines of character and depth, both red and white With a few exceptions the better examples from the Cote d’Or’s lesser ACs tend to offer more excitement. Perhaps the most exciting of Burgundy’s regions, certainly in terms of the number of emerging top quality small producers. Full-bodied minerally Chardonnay is produced from a number of appellations, pre-eminent among them being Pouilly-Fuissé and Saint-Véran. However Viré-Clessé and several Mâcon suffixed Villages names, such as Mâcon-La Roche Vineuse, are also important. The vast majority of Beaujolais is red and produced from Gamay. Generic examples come mainly from the south of the region. However it is the superior granite soils of the northern sector where the better Beaujolais-Villages, the crus Brouilly, Chénas, Chiroubles, Côte de Brouilly, Juliénas, Régnié, Saint-Amour together with the structured more ageworthy Fleurie, Morgon and Moulin-à-Vent offer wines of sometimes heady cherry, raspberry or even strawberry-scented intensity. One of the most northerly of France’s regions in the north-east of the country. The warm, dry, sunny climate of the area, enabled through protection by the Vosges Mountains, provides uniquely rich and strikingly aromatic wines which are labelled by grape variety and classified as Alsace AC or Alsace Grand Cru AC. There is also a spakling wine classification Crémant d’Alsace. The world’s greatest sparkling wine comes from this exposed marginal climate in northern France. Much of the wine is of potentially very high quality. All is produced from Chardonnay, Pinot Noir and Pinot Meunier and made by the classic Champagne method, emulated almost everywhere else for fine sparkling wines, with a secondary fermentation almost always in bottle. An extensive region which stretches from the Atlantic coast at Nantes and follows the Loire River to its source in central France. The Pays Nantais is dominated by just one wine, Muscadet, from a number of ACs. Anjou-Saumur is a source of the great sweet wines of the Côteaux du Layon, Bonnezeaux and Quarts de Chaume as well as some fine dry white from Savennières. Good, structured red and white are provided by Saumur and Cabernet based reds emanate from Saumur-Champigny. Touraine is home to the diverse, ageworthy Chenin Blancs of Vouvray and Montlouis as well as some fine red based on Cabernet Franc from Bourgeuil, Chinon and Saint-Nicolas-de-Bourgeuil. To the east are the vineyards of Sancerre and Pouilly-Fumé. Some of finest minerally, gooseberry scented Sauvignon Blanc is made here. The region also stretches south to the Auverne, where some soft easy-drinking red is made. The Alpine vineyards of Jura and Savoie provide some of the most unusual and strikingly flavoured whites and reds. In the Jura you will also encounter two rare and unusual specialities. Vin jaune (yellow wine) a dry white made aged naturally under a flor yeast like in fino sherry but producing very intense long-lived wines. Vin de paille (straw wine) is a sweet wine produced from late-harvested, dried grapes. The key appellations in the Jura are Arbois, L’Étoile and the Côtes du Jura. In Savoie Vin de Savoie and Bugey are the ACs to note. This huge sprawling area stretches down the narrow river valley of the Rhône towards Provence. The bulk of the regions output is generic Côtes du Rhône, almost exclusively from the south. There are also many high quality wines red and white produced throughout the region. Some of the worlds finest red and white wine is produced here. Syrah is the mainstay of the reds including the great wines of Hermitage, Côte-Rôtie and Cornas. Saint-Joseph and Crozes-Hermitage are increasingly important. A small amount of very ageworthy white is made at Hermitage and elsewhere from mainly Marsanne and some Roussanne. The exotically peachy Condrieu is the ultimate expression of the aromatic Viognier. As well as the sea of generic red produced here there are some striking and classic reds from the large AC of Châteauneuf-du-Pape. As elsewhere in the southern Rhône the wines are based on Grenache, and some of the finest expressions of the variety emanate from here. Its also well worth considering the reds of Gigondas and Vacqueyras as well as the reds and whites from many of the emerging Côtes du Rhône Villages. These are wines that currently offer exciting quality and often great value. This vast geographical area, still the purveyor of a vast lake of bulk produced Vin de France (formerly Vin de Table) and Indication Géographique Protégée (formerly Vin de Pays), is also the source of some of the most exciting, newly-emerging wines in France. Of the two sub-regions, this is much the larger. Key to quality in all the appellations are the isolation of excellent hillside terroirs and the planting of Rhône varieties both red and white. The Carignan variety is also proving a valueable resource old bush vines. Languedoc (which now covers the whole area) is by far the largest of the appellations with the smaller ACs Faugères and Saint-Chinian also providing wines of real substance. The appellations round the coast towards the Roussillon, including Minervois and Corbières tend to produce softer, lighter wines. Perhaps the greatest potential in the Midi comes from the vineyards of the Roussillon. The region was best known for the quality of its splendid fortified reds, Maury, Rivesaltes and Banyuls. However many old vine plantings are now providing exceptional raw material for a growing number of high quality light dry reds and a few very impressive whites also. Old Grenache and Carignan are of great importance and increasing amounts of Syrah and Mourvèdre are also being planted. Some wines are classified as IGP (Indication Géographique Protégée) others are Côtes du Roussillon and Côtes du Roussillon-Villages. Provence is becoming justifiably better known for the quality of its reds. Rhône varieties are widely planted in the key appellations. Cabernet Sauvignon is also becoming increasingly important. The top red AC, Bandol provides striking, long-lived reds largely based on Mourvèdre. Corsica offers some sound reds from interesting idigenous varieties and fine sweet Muscat. A wide and diverse range of wines are produced in this large area. To the north Bergerac produces reds and whites from the Bordeaux varieties. Big structured reds are produced to the south at Cahors, largely from Auxerrois (Malbec) and at Madiran mainly from Tannat. Some exceptional white is produced at Jurançon, including great moelleux, and good whites also emerge from Pacherenc du Vic-Bilh. Some of the most unusual and diverse styles come from Gaillac to the north-east of Toulouse.